Bali Blue Lagoon Beach is on the east side of Bali at Padangbai, about 1.5 hours drive from Kuta. But the beach was worth it – it was like a hidden paradise. Blue Lagoon Beach is clean and water is quite sheer so it’s easy to see what’s underneath. Another good thing, there are not many people there. Padangbai is a busy port where most people take the ferry to/from Lombok and Gilis, Komodo Islands and Flores. With its beautiful setting, small, unspoiled village feel, it must qualify as one of the most attractive port towns in the world. At the northern end of the town sits the eleventh century Pura Silayukti Temple and just beyond it lies the Blue Lagoon, a small white sand beach great for snorkeling, diving and relaxing in the local warungs. Blue Lagoon Beach is virtually over the hill from Padangbai harbour. Known as an underwater paradise, the water is warm and the marine life is abundant. You may well see clouds of ultraviolet fish daubed with splashes of luminous orange, followed by shoals of black fish with tails shaped like the head of a spanner, you might even see a fish in a leopard-print coat, and if you look carefully, you will notice cleverly camouflaged creatures hiding in the reef crevices. 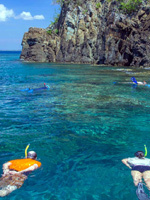 The coastline borders a coral garden where you can snorkel among psychedelic fish. There are two restaurants with reasonable food, showers, chairs and snorkeling gear. The beach is easily accessible. Several small shops in the main street of Padang Bai rent snorkeling equipment. On a calm day expect lots of fish and great visibility.